After coming off the worst Flu season in more than two decades, school administrators continue to search for ways to keep students and staff healthy and reduce absenteeism. When students miss school due to illness, they can fall behind academically and revenue is lost from attendance based reimbursements. When teachers are absent due to illness, costs go up when substitutes are needed. A new tool to help slow the spread of contagious illnesses. Even the best efforts at sanitation can fall short when contagious illnesses like the cold and flu are pervasive throughout a school. Some surfaces harboring germs simply get missed because they are complex in shape or maybe hard to reach. Think about a student desk, the top surface is easy to clean/disinfect, but what about the underside, the seat, rails, arms and legs? There is no doubt that the places that are likely to be missed are touch points where pathogens can accumulate! Where are the Germ Hot Spots??? Furthermore, cleaning staff often have limited time to cover large areas where traditional spray and wiping methods take a substantial amount of time. Enter the electrostatic sprayer, a special type of sprayer that charges disinfectant spray droplets so they are attracted to surfaces similar to opposite poles of a magnet. A battery powered electrostatic sprayer can uniformly cover a lot of surface area rapidly and insure coverage of all critical surfaces. Encourage hand washing and good hygiene, especially after using the bathroom. Place hand sanitizing stations in locations when water is not available. Ask sick teachers and students to stay home. Implement a High Touch Surface Disinfecting Program during cold and flu season. Regularly clean and disinfect surfaces. Use an electrostatic spray for end of day cleaning on surfaces. Cafeteria: Help prevent the spread of flu, common cold, and norovirus. Hallways and Common Areas: Student Lockers, chairs and tables. School Buses: Seats and rails. Gym: Wrestling Mats – Prevent cases of MRSA and Ring Worm. Weight Room: Barbells, weight machines, fitness equipment. Locker Room: Metal lockers in side and out. Behind toilets. While this is new technology to the cleaning industry, electrostatic spraying of liquids is widely used in other industries. Read on to see a few real world examples where electrostatic technology works. Example #1: Electrostatic paint spray systems charge paint particles so that they are attracted to surfaces to be coated. The benefit is uniformity of coverage, drastically reduced over-spray, and complex shapes can be coated even if they are out of the line of sight. Anyone that has ever used a can of aerosol spray paint to paint an object knows that only a relatively small portion of the paint actually hits the object. Electrostatic technology helps minimize over-spray. Example #2: Farmers use electrostatic sprayers to protect their crops from insects and disease. Electrostatic spraying of pesticides on crops results in more uniform coverage and allows for less use of pesticide. Most importantly, the undersides of leaves that would be missed with ordinary spray systems get treated with electrostatic systems. 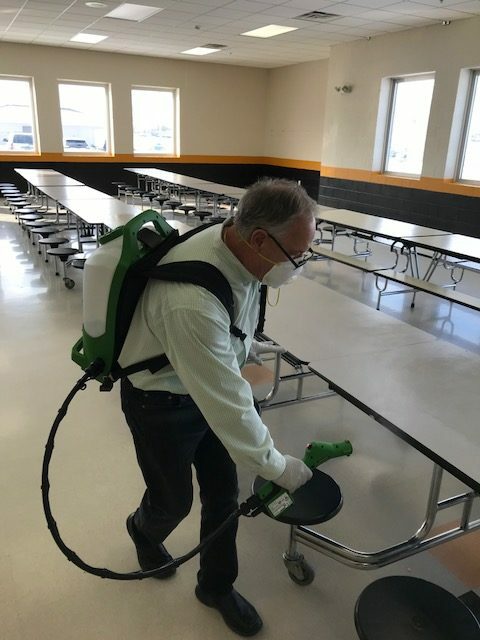 Typically, electrostatic spraying can use 40-70% less liquid per square foot of coverage through more uniform coverage and minimal over spray. With conventional sprayers, or misters, the only surfaces that will be coated are those that are in the line of sight of the spray nozzle. Electrostatically applied liquids have a wrapping effect, so that complex objects and areas hidden from the line of site get coated with the liquid. The most important benefit of electrostatic sprayers in the cleaning industry is around the application of disinfectants and sanitizers. During cold and flu season, electrostatic spraying of disinfectant solutions as part of the sanitation process can help reduce the spread of cold and flu. It can also reduce the transmission of other highly contagious illnesses such as Norovirus. POWER SOURCE: The electrostatic sprayers require a power source to charge the liquid particles and propel them toward the target object. 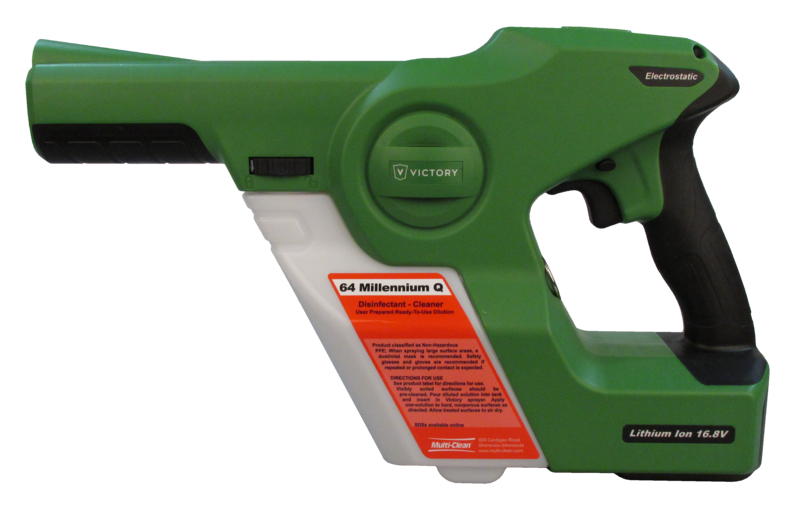 There are electrostatic sprayers that use a power cord that requires 120V wall outlets, and those that use rechargeable lithium ion batteries. The E-Spray System is sold by Multi-Clean through a network of authorized distributors. 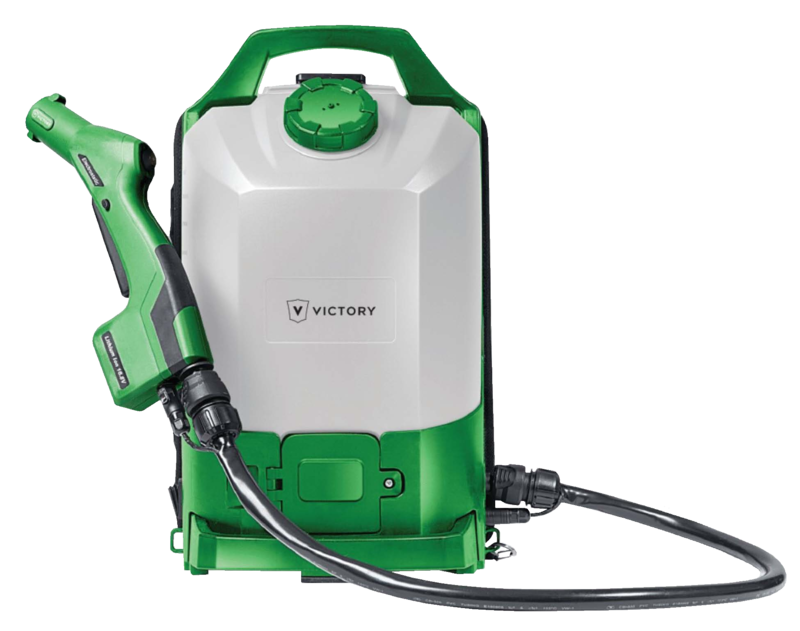 It includes the E-Spray Hand Held and E-Spray Backpack electrostatic sprayers for use only with Multi-Clean brand products that have been validated for use through the E-Spray System.